Cherokee is the leader in design of nursing scrubs, medical uniforms, and nursing footwear. Their brands include Cherokee, Workwear, Scrub HQ and Tooniforms all carried by Uniformed Scrubs. Cherokee nursing uniform scrubs in durable and stretch fabrics are extra comfortable and are ideal for hospital or medical office personnel. They are available in plus and tall sizes as well as maternity for women, men and unisex styles. The lines offer fashionable scrub tops, pants, and jackets in a variety of the latest styles and colors. 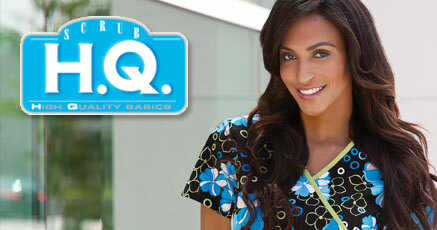 Cherokee scrubs are available at unbeatable discount prices at Uniformed Scrubs. Cherokee Uniforms have the classic styles for medical scrubs that are a continuous favorite. Fun prints and bright colors are the trademark designs that Cherokee is known for because they are consistently innovative and beautiful. Workwear was created by Cherokee to provide highly functional scrubs for the hardest working professionals. Easy care, rich colors, essential pocket features and added touches to improve the wear of Cherokee scrubs. Scrubs HQ are your favorite Cherokee prints at lower prices. Weather you like cartoons or playful animal prints, Scrubs HQ has you covered with stylish, affordable scrubs that are incomparable. Tooniforms by Cherokee are the most fun and playful scrubs with iconic characters and cartoons. These beloved world-famous characters come together in a playful collection that is full of personality that brighten up your workplace with fun designs and bright colors. Cherokee Uniforms can be found exclusively at Uniformed Scrubs with the most competitive prices. New styles and products are constantly updated. Find your favorite today!